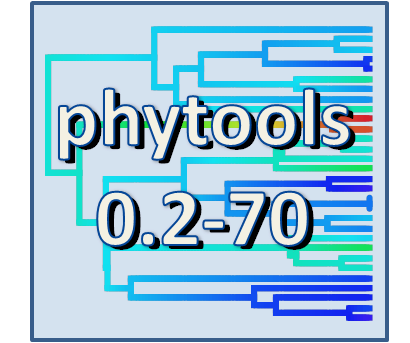 A new version of phytools (0.2-70) is now available on CRAN. It can be downloaded & installed from source. Package binaries should be built and percolate through the CRAN mirror repositories over the next few days. 1. A much faster version of read.simmap that addressed a memory allocation issue of earlier versions. 2. Numerous updates to make.simmap (e.g., 1, 2). make.simmap now (optionally) samples from the full (rather than conditional) posterior distribution of substitution rates and discrete character histories, and allows the use to control the prior distribution on the substitution model. 3. A bug fix in fastAnc. 4. Big speed-ups for the function estDiversity and rerootingMethod. 5. Much faster versions of countSimmap, describeSimmap, and getStates. 6. A bug fix & update to the function phylomorphospace. 7. New versions of densityMap and contMap. 8. A new version of rerootingMethod that allows for any symmetric substitution model. 9. A totally new function mergeMappedStates, to multiple mapped states into a single state. 10. A new function getCladesofSize that extracts all reciprocally monophyletic clades from a tree that can't be further subdivided into two (or more) reciprocally monophyletic clades of size n or larger (1, 2). 11. A new function extract.clade.simmap that extracts a clade from the tree while preserving a mapped discrete character. hi Liam! I wonder if you would consider a blatantly self-serving request/suggestion. It would be really cool if simmap and densityMap trees could be plotted as radial (type='fan' in plot.phylo) trees. I find it much easier to visualize the patterns when the tree is quite large. I tried jerryrigging it by going under the hood of the plotSimmap function which quickly showed me I was completely over my head, and I also tried to fake my way using plotBranchbyTrait, which allows radial trees, but the results were obviously quite different. Anyway, no idea if this is a trivial or really hard request, but I thought I'd throw it out there - could be a cool complement to your new MEE paper!